MOSCOW, Russia -- Tensions between Moscow and Kiev continue to mount with Vladimir Putin's latest show of force as Russia dismisses Petro Poroshenko's "peace plan" as an ultimatum. 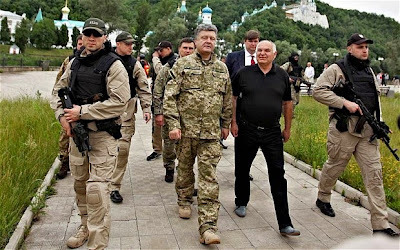 Ukrainian President Petro Poroshenko (centre, fatigues) has declared a one-week, unilateral ceasefire to try and end the bloody conflict with pro-Russian insurgents in the country's east. Vladimir Putin has ordered troops in central Russia onto “combat alert” in snap military drills a day after confirming the country is beefing up its presence on the Ukrainian border. The move, which will not affect troops stationed on the Ukrainian border, follows a series of reports of fighting in eastern Ukraine spilling over the frontier into Russia. Announcing the move on Saturday morning Sergei Shoigu, the Russian defence minister, said the drills would run from June 21 to June 28. “In accordance with [Mr Putin’s] order, from 11:00AM, Moscow time, the troops of the central military district as well as formations and military units on its territory have been put on full combat alert,” Mr Shoigu said. While Russia’s Central Military District does not border Ukraine, the move will be seen as another show of force as tensions between Moscow and Kiev continue to mount. The move comes a day after Petro Poroshenko, the Ukrainian president, announced a seven-day unilateral ceasefire in eastern Ukraine in a bid to implement a peace plan he unveiled earlier this week. Mr Poroshenko’s peace plan would see early elections, greater autonomy for the east of the country, and an amnesty for rebels “who have not committed serious crimes”. But separatists had no part in formulating the plan, and both the Kremlin and rebel leaders have rejected the deal as an “ultimatum” rather than a true effort to find dialogue. Announcing the move during a visit to troops in east Ukraine, Mr Proroshenko described the ceasefire as an opportunity for rebels to lay down their arms, but warned Ukrainian forces would return fire if “in case of an armed attack on the Ukrainian units or civilians”. Ukrainian forces appeared to be gaining ground before the ceasefire came into force at 10:00PM on Friday night, with defence officials claiming to have killed up to 300 rebels in recent fighting. Fighting continued overnight, despite the ceasefire. The Ukrainian defence ministry said rebels attacked three border posts overnight on Saturday, as well as making two assaults on an air-defence unit in the Donetsk region. Tensions on the Russian border have mounted, with Russian security agencies claiming that fighting and shelling around border checkpoints has spilt across the border. The FSB, Russia’s successor agency to the KGB whose responsibilities include guarding the country’s borders, said a Russian customs officer had been injured during fighting on the border of the Rostov region. The Kremlin has demanded an apology from Kiev over the incident. The agency later said that 80 Ukrainian border guards had crossed into Russia following intense fighting at a Ukrainian border post. Last week the FSB claimed Ukrainian forces abandoned an armoured fighting vehicle on Russian territory after crossing the border into the Rostov region. The report could not be independently confirmed. Rebel fighters are known to have crossed the border to Russia to escape heavy fighting in the past. Ukrainian authorities have in turn accused Russia of sending increasing amounts of military hardware across the border to the rebels, including several main battle tanks that have appeared with rebel forces in recent days. On Friday the White House announced fresh sanctions against the Ukrainian rebels, including asset freezes applying to seven key separatist leaders. The names added to the US Treasury’s sanctions list include Igor Girkin, the commander of rebel forces in Slavyansk, and Denis Pushilin, the chairman of the self-declared People’s Republic of Donetsk. The White House said the move was in response to Russia’s failure to “de-escalate” the situation in eastern Ukraine, and warned that narrowly targeted “scalpel sanctions” against Russian economic assets could follow. In case when Ukrainian Central Bank prints some of its own money for instance USD1billion, all of this money must be distributed in the form of a loan or multiple loans to domestic borrowers. For example this loans could be distributed between small business performing government contracts and used for modern equipment build in Ukraine. (If such exist) Ukraine need machines to build modern machines and equipment. At this difficult economically period for Ukraine any one or any country who call them self a friend of Ukraine must do some thing generous. For instance Ukraine owed to lets say Germany USD3billion, Germany should illuminate the interest which attached to it and simply right it off. Each such friendly country must do that, if not with full amount of a debt, than at list to 50% of it. As far as I remember USD3billion of Poland's total debt to USA was completely written off, principal and interest all together. That is a true friendship. For the next 10-15years Ukrainian National Goal must be, is to get read off IMF dependents for 100%. Instead Ukraine must become a credit reliable country and use the National bond system to borrow money abroad. In which case other country must trust enough in Ukrainian system to buy its National bond. Ukrainian people must never again be enslaved by any other nation, group of nations or by its own oligarchs. (In the case of its own oligarchs, some level of slavery will always exist and it is OK, as long as, more than 50% of Ukrainian population would have a dignified existence.